Eight years after his arrival into the clubhouse just a few feet away in Clearwater, Fla., where he memorably made his first impression as a Philadelphia Phillies player by arriving to work before anyone else in the building, before the sun came up, before even Chase Utley thought was an appropriate time to show up on his first day of spring training, Roy Halladay was remembered by the baseball community. The Halladay family, the Phillies, and the Toronto Blue Jays hosted a celebration of Halladay’s life at Spectrum Field, where the Phillies call spring training home and where the late pitcher had set up an office within the last year as he transitioned toward a post-playing career as a roving pitching instructor and mental skills coach. They all gathered – friends and family, former teammates and coaches – to say goodbye. A stirring, 90-minute ceremony was held late Tuesday afternoon, almost exactly a week after the tragic news that the 40-year-old Halladay died in a plane crash in the Gulf of Mexico. The field was decorated with flower arrangements just behind the mound: a blue one with the “32” Halladay wore in Toronto and a red arrangement with the “34” he wore in Philadelphia. The numbers were also etched into the dirt on the mound, just in front of the pitching rubber. The ceremony was televised live on MLB Network and simulcast for folks in Philadelphia and Toronto to watch online. The crowd in Clearwater was populated with many familiar faces, including Jimmy Rollins, Chase Utley, Raul Ibanez, Ryan Howard, Brad Lidge, Kyle Kendrick, Charlie Manuel, Chris Carpenter and Scott Rolen, among others. Phillies broadcaster Tom McCarthy worked as the master of ceremonies and nine people, including Halladay’s father, Roy Halladay Jr., and his wife, Brandy, shared their remembrances. If you care to watch the entire ceremony (have some tissues handy) you can click on the video above. But here are some highlights, beginning with the comments made by Phillies general partner John Middleton, who called knowing Halladay “one of the greatest privileges” of his life and recalled a story of the late pitcher’s kindness toward children in need. “Doc was, without question, one of the greatest pitchers of this generation,” Middleton said. “In fact, you can make that statement about any generation. But he was a great pitcher because he was first and foremost a great person. The man made the ballplayer, not the other way around. A grief-stricken J.P. Ricciardi followed Middleton to the microphone. Ricciardi, who served as the general manager of Toronto during Halladay’s Blue Jays career, quoted Tim McGraw lyrics, saying Halladay lived them in “always staying humble and kind." Roy had many gifts on the field, but in my opinion, his biggest gift came off the field. He had the effortless ability to deflect pride onto others, something that in today’s game is tough to do. Cole Hamels, a pitcher 6 1/2 years Halladay’s junior, became teammates when the Phillies traded for the long-time Toronto ace after appearing in back to back World Series. Hamels said he didn’t just learn how to become a better pitcher by watching the man universally considered the best in the game but also learned how to be a better man, too. “How you want to treat others, live a life of baseball and fatherhood – he exemplified the best and the most humble loving person,” Hamels said. “It’s something that I know I strive to tell my boys, to drive to be the best, strive for excellence. Find somebody who is going to make you better. Roy did that for me. But even at the same time, you have to understand what you have to do with that. When you become the best, what do you do? Roy showed everyone what to do. He was not boastful. He was the most humble human being I’ve ever met. The type of talent and integrity he had in the game of baseball. After former Blue Jays athletic trainer Greg Poulis spoke, sharing a story of breaking down at the 2009 All-Star Game because he was proud of the career Halladay was having and jokingly told to quit by the pitcher for being too emotional, Utley spoke to the crowd. For the first time at a microphone behind the mound since his infamous Halloween performance in 2008, Utley’s words were just as memorable. 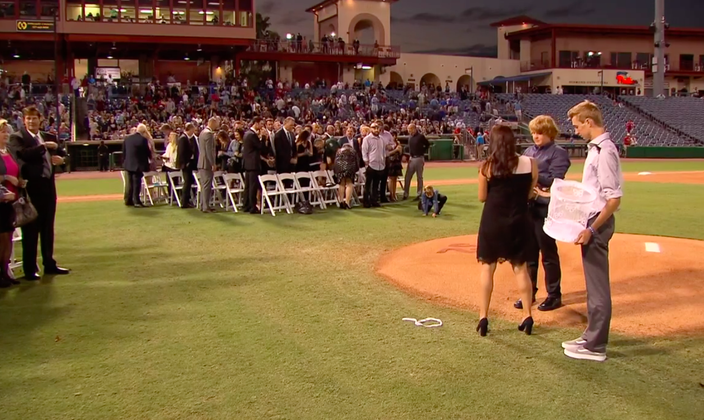 Utley had to pause and regain his composure, fighting off the tears that wanted to come, when he personally spoke to Halladay’s teenage sons, Braden and Ryan, at the end of his speech. “He was a professional, he was a gentleman … throughout his entire career,” Utley said. “As a husband and a father, I understand the demands this career puts on our families. We can’t do this alone and I’m a firm believer that without our family’s support, we would not be able to achieve our ultimate goals. Braden and Ryan: we talked a lot about you guys. You were a little bit shorter back when we first began talking about you. Charlie Manuel recalled first meeting Halladay at the 2009 All-Star Game, when he was the National League’s manager and Halladay was the American League’s starting pitcher. Halladay’s name was the biggest in baseball’s trade rumor season that July, and Manuel recalled telling him “he’d look good in a Phillies uniform.” Less than six months later that became a reality. You’ll always be able to google Roy Halladay and see his stats... But what you can’t google is his heart. His grace. His kindness. His caring for others. His generosity. Or his love for his family. Three months after first seeing Halladay’s work up close and personal in Clearwater, Manuel watched from the dugout in Miami when the pitcher threw a perfect game. But it was after that when he truly saw who Halladay was as a person. Manuel promised Halladay's two sons, Braden and Ryan, that he'd get their baseball schedules and attend as many of their games as he could. Tuesday’s ceremony was often tough to watch. The camera continuously panned toward Halladay’s children. Hearing his father and wife speak about the man they truly cherished was heart-breaking. Thankfully Carpenter, one of Halladay’s closest friends in baseball, someone he first met 20 years earlier, when both were at Triple-A Syracuse as top Toronto pitching prospects, helped lighten the mood with a story that showed off Halladay’s fun-loving personality. The two had gone on a fishing trip in Brazil during one of the offseason during Halladay’s Phillies career. “He was never afraid of a challenge or doing something that others might now want to do or dare to do, like one of the times we went fishing and it was 100 degrees out, and he wanted to jump into the Amazon River,” Carpenter said. “Remember now, we’re in the jungle. And the water is as clear as a cup of coffee. And we’d been catching piranhas all day. I looked at him and said, ‘You’re freaking nuts.” He said, ‘ I know. Now come on, Carp, it’s wicked hot and I’m sweating like crazy. And we can say we swam in the Amazon River. Who do we know that could ever say that?’ I was like, good point, let’s do it. Wearing sunglasses, Carpenter fought back tears as he recalled sitting in the St. Louis Cardinals team bus outside Citizens Bank Park on the first Friday night in October back in 2011, the night he beat his friend in an epic, 1-0 Game 5 of the National League Division Series. “After pitching his heart out,” Halladay congratulated his friend while seated inside the Phillies clubhouse and wished him luck the rest of the way. “I could talk about when he came back (from Class A), he totally revamped his mechanics, his mind. He told me he’d never be that bad again,” Carpenter said. “You could see it on his face, in his body language, that he was going to dominate and never look back. And that’s what he did. … He said he would be that bad again, and he never was. He was great. He was the best of our generation, a Hall of Famer. He’ll never be forgotten. “But here’s the thing. You’ll always be able to google Roy Halladay and see his stats. All his accomplishments and all his awards. But what you can’t google is his heart. His grace. His kindness. His caring for others. His generosity. Or his love for his family. He wasn’t put on earth to be a good baseball player, that was just his job. Halladay's widow, Brandy, and the couple's sons, Braden and Ryan, release butterflies at Spectrum Field following Tuesday's memorial.